Before cable television, most South Carolinians had few television viewing options. Three networks and perhaps one or two independent or public broadcast stations. In many places in South Carolina, choice was even more restricted. TV signals were too far away to be viewed well, if at all. 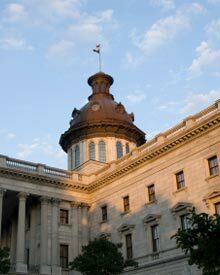 Cable was introduced to South Carolina to improve the reception of existing programming. Today, cable offers so much more, it offers worlds of entertainment options to people throughout the State, every day, 24 hours a day, for just pennies a day, and that's a real value! Today, cable's broadband infrastructure is living up to its promise of being the perfect pipeline for delivery of many advanced services, including high-speed cable modem internet service, digital video, interactive TV and residential cable telephony. The cable instruct here in South Carolina and across the US is actively providing facility upgrades, better sound and video, innovative quality programming, improved customer service, and new broadband services. Investments in these improvements will yield higher value for customers, making cable the technology of choice in the increasingly competitive telecommunications industry. 1,020,980 South Carolina households in 461 communities are served by cable and that number continues to grow daily. Some 3,000 South Carolinians are employed by cable systems through the State, earning an aggregate payroll in excess of $60,000,000. In total, South Carolina's cable systems pay over $10,000,000 in property taxes annually. South Carolina's cable systems return more than $33,000,000 in franchise fees to local governments to fund needed programs for South Carolina's cities and counties. Cable's economic contribution to our state is not limited solely to taxes and franchise fees. Goods and services purchased by South Carolina's cable systems from State and Local business exceed $300 million annually. South Carolina's cable systems are good corporate citizens, supporting Little League teams, Clubs, Schools, Libraries, Churches, Scholarship Funds, Y's, Fire Departments, Blood drives, United Way, MDA, Toys for Tots, March of Dimes. South Carolina's cable systems contribute some $20,000,000 annually to charities and local projects in this State. Even more importantly, our local access channels have given new platforms to almost every segment of South Carolina's society. Because of special interest groups, minority organizations and coalitions have the ability to gain awareness and support for their particular causes, at virtually no cost to them. The cable industry in South Carolina... one of our state's most rapidly advancing and innovative technologies ... is proud to be a major contributor to the growth of our state. We are constantly seeking ways to improve our service to our customers and to the communities we serve. For comments, suggestions, and additional information on the cable television industry in South Carolina, please feel free to contact us. Cable supports education as a key to the future growth and success to our state. As members of the cable in the Classroom consortium since 1989, cable systems throughout South Carolina provide educational programming and support materials to public schools, as well as cable service, hardware and, in some franchise areas, internet connections, all at no cost to schools. The industry, in partnership with the National PTA also supports the "Family and Community Critical Viewing Project" that teaches parents and teachers how to take charge of the television viewing experience. Reaffirming its commitment to education, in 1997 SCCTA form the South Carolina Cable Television Foundation to fulfill an increasing need to develop leaders in communications and communications technology in South Carolina. Since its, the Foundation has committed over $200,000 in scholarship funds to South Carolina's colleges and universities, benefiting students from the state who might not otherwise have the opportunity to advance their career goals in the communications field.